Donovan Alex yearns for authentic Mexican cuisine but because he lives in Queensland, Australia he has to settle for searching the land for the perfect burger. And that is not an easy task in the land where they regularly spoil a decent burger with a huge slice of beetroot. His unsatiated desire for some traditional home-cooked Mexican dishes may have pushed him slightly into madness; the madness that is needed to create art of such awesomeness. You might know him as B-Fan. 65 Donovan Alex t-shirts on the Shirt List. 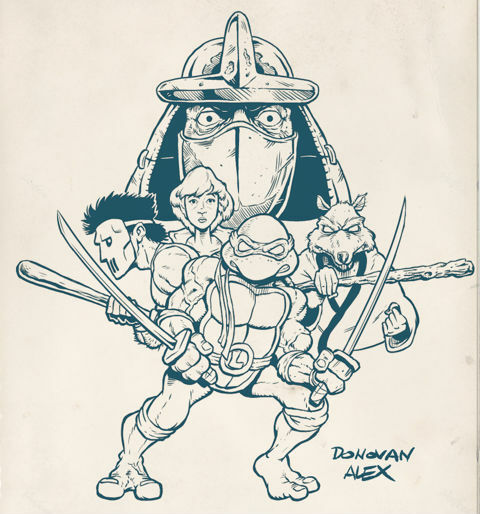 While not designing t-shirts, suffering through yet another Vegemite sandwich, and obsessing over the Teenage Mutant Ninja Turtles, Donovan is also a working musician. He’s an interesting guy and great artist. Read on to learn more. Where did the nickname B-Fan come from? I guess it has an alternative feel to it and it sounded cool too. I see on Facebook that you are based in Queensland, Australia but I believe you were either born in a castle under the sea or Mexico. Although, perhaps they are not mutually exclusive? When did you move down under? Haha, as much as I like the underwater castle origin, the fact is that I was born in the chaotic (but enigmatic) Mexico City in the late 70’s, so that makes me a very fortunate 80’s kid and 90’s teenager. What an era! I moved to Australia two years ago and I love it here. I’m still working on my didgeridoo chops and vegemite assimilation. Queensland is a beautiful state, with great beaches, forest, wildlife (from cute to creepy) and in the area where I live there are no traffic jams. The wine is not expensive and very good. What do you miss about Mexico? The food, of course, my family and friends too but I can still Skype with them. Please, someone, invent an app to transfer food online! I enjoy reading and studying art books and comics, browsing DeviantArt, watching online art tutorials (Mexican cooking tutorials too, of course! ), video blogs from movie critics, study jazz guitar and search in restaurants for the perfect burger. Mainly self-taught but with some art lessons from my Graphic Design studies. I have some comic book projects still at conception stage and I might be scoring a short film soon. So many influences, just to name some I’d say that the classic MAD Magazine artists: Wally Wood, Jack Davies, Mort Drucker, also Will Eisner, Robert Crumb, Steve Mannion, Eric Powell, Todd McFarlane and some fine-art greats like Toulouse-Lautrec, Van Gogh, and Egon Schiele. 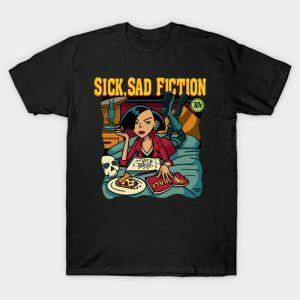 From watching other artists’ work, from a visually powerful movie or a cool music album cover, comic book artwork and inventive graphic design. For digital, I do some thumbnails of the idea on paper, I might also do separate sketches for the faces to achieve expression and likeness if required, if it works I scan it and scale it to do a rough sketch, check and fix the proportions, the composition and gesture, then I do the line art and render it, then add typography and effects and format it for the final media. For traditional, I sketch, transfer to digital so I can easily adjust the composition, tighten the sketch digitally and lightbox it to size, then ink and colour it. From friends sharing some cool mashups on social media. I became a fan and started following these sites. 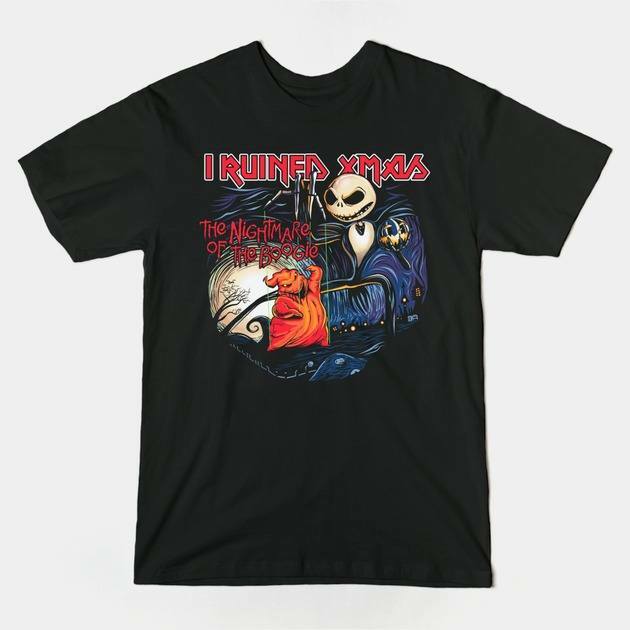 It was an Iron Maiden/Jack Skellington mashup. I was so excited to see it on the daily tee display on RIPT Apparel, I took photos and screenshots of it, everyone at home was excited, we even had a whiteboard with a graphic for the sales and kept track every half hour. Hahaha. 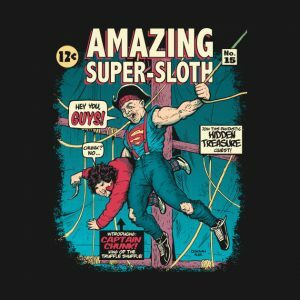 Mainly RIPT because they seem to be the most concerned about being the very first one to sell the design. Plus, they gave me my first print, so I guess it is fair, but it will also depend on the design, with time I learned which ones are more suitable for each site so it is not a golden rule. I love working with all of them though. They all have been very kind with my work, I reckon. 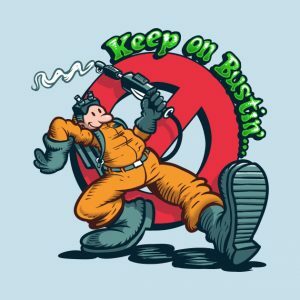 You sell your designs on TeePublic, RedBubble, NeatoShop, and bfandesign.com. Which performs best for you? 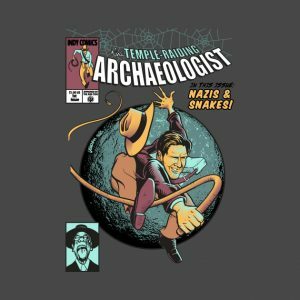 TeePublic, but there has been a massive design takedown recently so now I don’t know anymore. 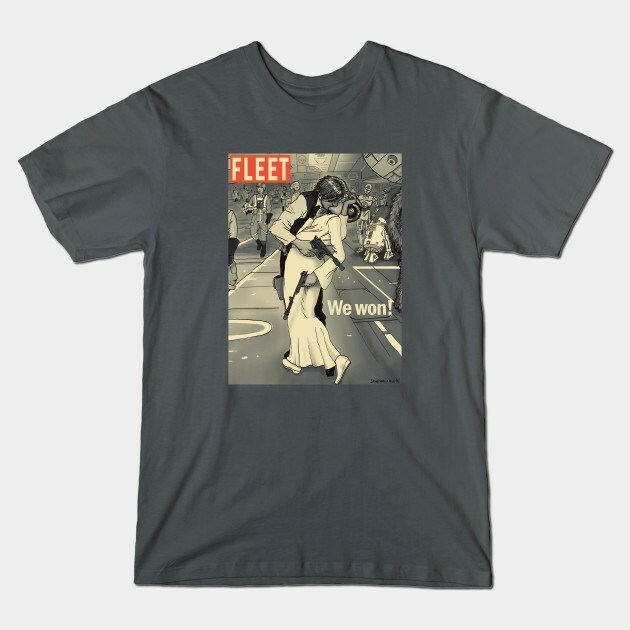 www.bfandesign.com is for the local Australian sales. Neatoshop has an awesome interaction with the artists through Alex. In my experience the sales are not great but they are always there to answer your questions and help. Also, their Artist Drop-ship program is great. Probably a tie between ‘Amazing Ninja Dude’ because I love that McFarlane cover and I’m happy how it came out with my style and ‘Sick Sad Fiction’ because Pulp Fiction is one of my favorite movies ever and I love the personality of Jane Lane. Design wise it works really well as both a tee and a poster. 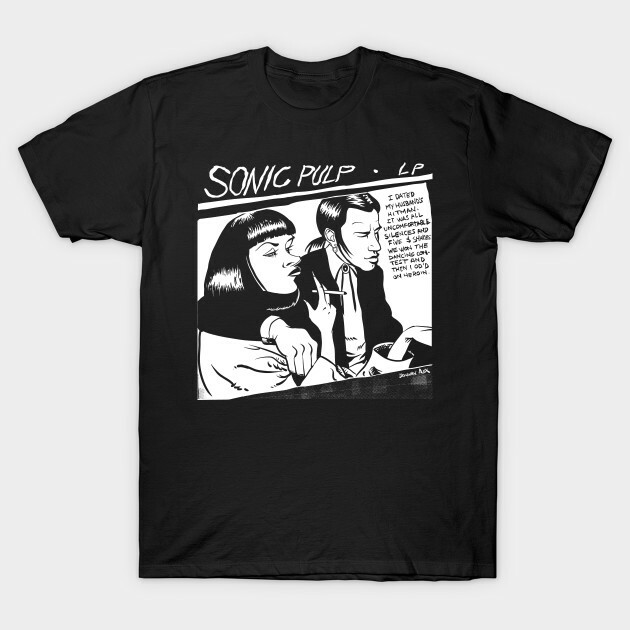 Yes, mainly for the conventions and for some rock gigs I wear a Pulp Fiction/Sonic Youth mashup. 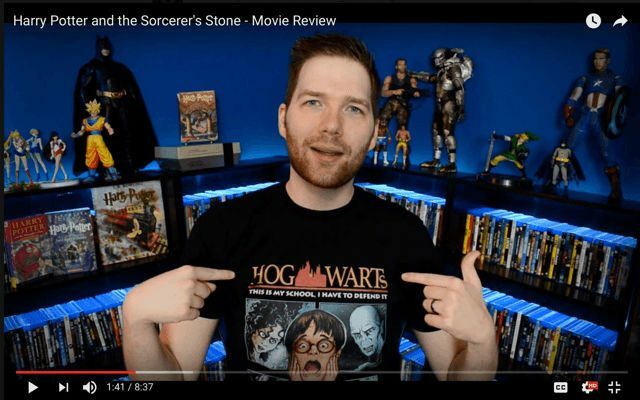 I was mind-blown when I saw YouTuber Chris Stuckmann wearing my Harry Potter/Home Alone mashup for some of his HP reviews, it was awesome and unexpected. 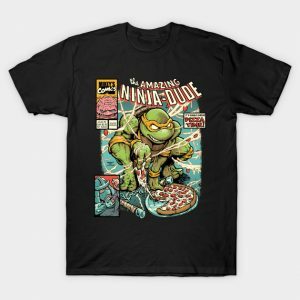 Also, when RIPT printed the first version of Amazing Ninja Dude, none other than the great Kevin Eastman shared it on his Facebook, that was a huge honor! Photoshop for rendering and effects, I don’t use Ai much, unless there’s a complex logo or shape that requires vector treatment. 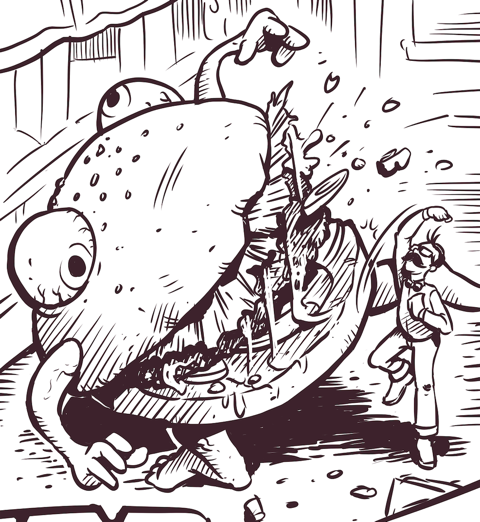 For line art I use Manga Studio, I love its brushes. It’s hard to pick one, but it has to be one between Old San Juan in Puerto Rico. Downtown Mexico City. Whitehaven beach in Queensland or the Fortress of Louisbourg in Nova Scotia, Canada. Europe is still on my bucket list, I want to visit museums like Del Prado, Louvre, and D’Orsay. BeastPop, Butcher Billy, Megan Lara, Hugo Dourado and Obvian. It’d be cool to read about any of the guys I mentioned above.